Our members at One Housing Group are taking 3 days of strike action next week. Following a three year pay freeze, support workers there are being dismissed and re-engaged on much worse contracts meaning pay cuts of up to £8,000 each. The average cut is £2,000. At the same time the organisation is making record surpluses, which rose by 200% in the supported housing wing alone last year and the CEO, Mick Sweeney, took a £31,000 pay rise. Thanks in advance for any and all support you may be able to offer. Employees of One Housing Group are being dismissed and reengaged on worse contracts, while the organisation sees profits rise and the CEO has enjoyed a £31k pay rise! 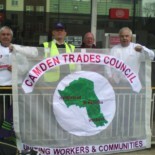 This entry was posted on June 13, 2013 by CAMDEN TRADES COUNCIL.